Submitted photo Soin Medical Center & Greene Memorial Hospital CEO Rick Dodds with staff and management at Soin Medical Center after receiving the Center of Excellence award. BEAVERCREEK — Soin Medical Center receives fourth Center of Excellence Award. The Center of Excellence is a designation awarded by an outside firm – the Surgical Review Corporation. The most recent award Soin has received is in its GYN department. This is the fourth COE designation for Soin. Other areas in which they have received this designation include: hernia surgery, minimally invasive surgery and robotic surgery. “I think that speaks volumes to the care provided by Surgical Services at Soin,” said Director of Nursing, Perioperative Services, Centers of Excellence, Invasive Cardiology, & Maternity Services Barb Robinson. Established in 2003, SRC is an internationally recognized healthcare leader committed to advancing the safety, efficacy and efficiency of surgical care worldwide. The process to receive this award comes with a vigorous review with 10 standards – categories in that the hospital demonstrated adherence. Within each category, there are multiple requirements that must be met from executive support, to the instruments and equipment available in the operating room. With a goal to improve lives in Greene County, Robinson believes this designation validates Soin’s mission with the goal to improve lives in the communities in which it serves. “We provide the best care given by the most qualified surgeons and nurses that a patient can receive,” said. Robinson. 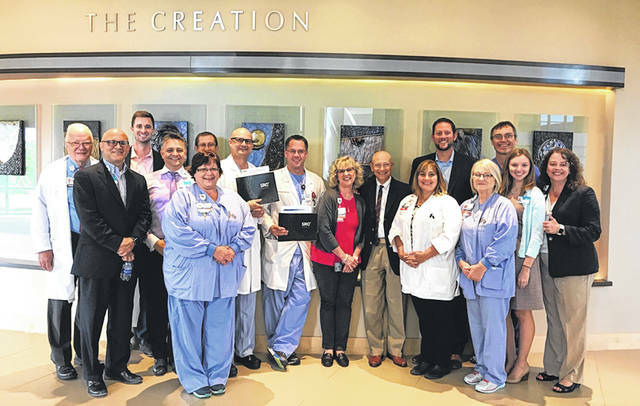 https://www.fairborndailyherald.com/wp-content/uploads/sites/50/2018/09/web1_Excellence.jpgSubmitted photo Soin Medical Center & Greene Memorial Hospital CEO Rick Dodds with staff and management at Soin Medical Center after receiving the Center of Excellence award.